Many of us, including you, my brother priests, are familiar with the laborious process of writing a mission statement. Almost every organization has a mission statement: universities, businesses, non-profits, and even parishes . . . . And if you’ve ever tried to write a mission statement, you know it isn’t easy. It takes time and patience and it requires a lot of consultation. And here’s the challenge: in two or three brief and jargon-free paragraphs, you are expected to capture why the institution exists in the first place, whom it serves, how they are served, and why everyone else should pay attention. What’s more, this little work of art has to be “sold” to other wordsmiths, such as fellow parishioners, board members, and administrators. Sometimes these statements are rejected outright; often they are simply ignored. This is not to say they shouldn’t be attempted…only that writing them isn’t easy. Dear brother priests, we should reflect on the mission of Jesus à la Isaiah. First, Jesus said he was anointed by the Holy Spirit and sent by the Father. And he was sent to the poor – the poor and the poor in spirit. He was sent to bring glad tidings, that is to say, the Gospel. The Gospel he brought was not mere words on a page, however inspired or inspiring. Jesus was sent to bring the liberating and healing power of God’s love: the love that frees us, caught in the thrall of sin; the truth that opens our eyes, shrouded in error; the power to break free from all that holds us captive, literally and figuratively. But let’s remember the rest of Jesus’ mission statement. “Today, this prophecy of Isaiah is fulfilled in your hearing” – i.e., in Jesus himself. In a phrase, the appearance of Jesus on the face of the earth is itself the Good News: Jesus himself is the message and the mission. Anyone who would share in this mission must be deeply rooted in Jesus. Dear fellow priests, this night the Church calls us to be renewed in our mission. Like Jesus, we are anointed by the Holy Spirit and sent to proclaim the Gospel. By Holy Orders – in the laying on of hands and the anointing with Chrism – we share not in some abstract mission but in the identity and mission of Jesus, “the faithful witness…who loves us and has freed us from our sins by his Blood….” The Gospel we preach must continually permeate every part of our lives. The Sacrifice we offer must be manifest in our attitude of self-giving love. This evening, we are invited to return to Jesus, the source of our priesthood. We are invited to reflect on the origins of our call to be a priest not to lose ourselves in nostalgia but to allow the Lord to call us again, to rediscover in Jesus the source and summit of our priesthood. As we renew our priestly promises, let us prayerfully encounter the One who is our Shepherd, our Savior, our Great High Priest, our companion and friend. Anything and everything we hope to do in renewing a spirit of evangelization in our parishes and throughout the Archdiocese hinges on our encounter with Jesus – today and every day of our priestly lives. Only then will our pastoral planning bear the good fruit of the Gospel. Dear brothers and friends, together let us be deeply rooted in Jesus! Dear brothers and sisters: In renewing our priestly promises this night we, your priests, not only promise to serve you, but also to partner with you in fulfilling the mission the Lord has entrusted to his Church. We promise this night to be priests, not for ourselves but for the Lord and for you – and not only for you but also side-by-side with you. I hope everyone in this Cathedral is firmly convinced that all of us, priests and deacons, laity, & religious, need to work together for the sake of mission. In the joy of the Gospel and with the strength of the Sacraments, let us seek to undergo a missionary conversion in our own lives – and in parish communities throughout the Archdiocese of Baltimore. Let us reach out in love to those who do not practice their faith and to those who are searching for the glad tidings Jesus came to bring. 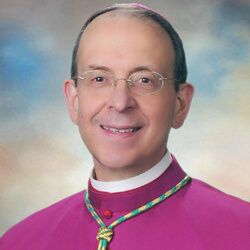 This requires a warm and loving partnership between priests and people, a partnership forged by the Spirit and rooted in the Person of Christ, a partnership in which each of us lives our respective vocations to the fullest, a partnership which brings new life and vitality to our communities and families, most especially our young people and our young adults. By praying and working together, we will raise up new vocations to marriage and family, to priesthood, the diaconate, and consecrated life. By praying and working together, we practice a charity that evangelizes and helps to transform the society around us in the ways of justice and peace. By praying and working together, we will indeed be ‘a light brightly visible’. This night my heart is filled with gratitude to the Lord – for you, my brother priests, with whom I am privileged to serve – thank you for the burdens you bear and the witness you give. With my brother priests, I am grateful to you, the people of the Archdiocese, who join us in countless ways in carrying forward the Lord’s mission: to bring glad tidings … to set free … to heal … to unite … to redeem. May it come to pass that this mission is fulfilled in us and through us – and may God bless us and keep us always in his love!